Ireland, one of the fastest growing economies in the world and it is adjoining to United Kingdom. You will wonder to know, the 40 percent population of Ireland is below the 25 year of age. Ireland's beautiful landscape provides a rich environment for many outdoor leisure activities. It is also renowned for rich cultural heritage with its own distinctive language music, culture and sports. Ireland is recognized as an international location for high quality scientific research. Every year almost 200,000 students come to study in Ireland from all over the world. 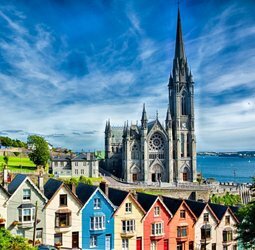 Ireland is an English-speaking country; with close cultural, economic and educational links with the English-speaking world .Ireland is the European hub to over 1,000 leading multinational companies (Google, HP, Apple, IBM, Facebook, Linkedin, Twitter, Pfizer, GSK and Genzyme). Quality Education: Education has been a key factor in making Ireland one of the fastest growing economies in the world Irish higher education institutions are widely recognized for excellence because of availability, extensive range of programs. Recognized Qualifications: Irish University, Colleges & Technical institutions have a qualification from NFQA (National frame Qualification Authority) which shows the excellence of multidimensional course framework that has been offered to students. Cost of living: Ireland is a growing study destination with competent economy that suits an international student to bear the educational cost & living expenses with the scholarships and part time job. Supportive Learning Environments: Dedicated international offices work closely with academics, administrative and specialist staff to fully support students throughout their time in Ireland. Through these support structures, students receive direct access to information, facilities, services and staff. Broader Course Opportunities: Many of higher educational institutions of Ireland’s provide variety of courses in different streams (medicine, science, technology, engineering, business, law, languages, literature, history, philosophy, psychology etc.). You have so many options in your hand to choose a good course, which create building block for your success. Multitude work scope: Ireland has 4.4% unemployment rate with home country of top leading multinational companies. Irish system allow you to do part time job during your study, it give you chance to work with variety of people in many circumstances, understand the requirements and enhance your knowledge in various field. Friendly & Safe Environment: Irish people are renowned for their friendliness, which greatly contributes to comfort overseas students for opting student life in Ireland. it is also regarded as a safe country to study and live in. The Global Peace Index ranked it as the 12th "most peaceful country" in 2013. Multicultural society: Ireland is a multi-ethnic, multicultural European country with a thriving immigrant population here to stay. The Republic of Ireland combines adventure, history, culture, and entertainment into one fascinating place. Richness of culture, breathtaking scenery, and friendly people make it an ideal study destination for any international student. Post study visa: One of the major benefits of studying in Ireland is the post-study visa. This makes it easier for students to look for job opportunities in the country after they graduate, and once they have a job, they are eligible to apply for a green card/work permit. Study in Ireland will be a passport to a successful career. Historically, Ireland was always one of Europe’s poorer countries, however, in the last 20 years; it has grown into one of Europe’s wealthiest nations. And the quality of the Irish education system is a major contributing factor to the rapid rate of economic growth. The Irish Education System is divided into three basic levels: Primary (for 8 years); Secondary (for 5 or 6 years) and Third level which offers a wide range of opportunities from post-Secondary courses, to vocational and technical training, to full degree and the highest post-graduate level. Apart from this, Ireland education system accepts student's for post graduation with 15 yrs of education, unlike some countries. NFQA maintain quality Standard of Ireland education system. Ireland is famous as an international hub for high quality scientific research. Many students from around the world, including India, choose Ireland to pursue research in various fields. Ireland's worldwide reputation for high quality education is built on the solid foundation which gives commitment to success in various fields. Many of Ireland’s institutions of higher education are internationally ranked, and with many strong programs (5000+) in a variety of areas such as technology, engineering, science, medicine, health, business, law, humanities, literature, history, languages, philosophy, psychology and many more. Student can choose any sort of degree, diploma and certificate courses. Traditionally the tertiary educational system has comprised the university sector, the technical colleges and the colleges of education - funded by the state and self-governing. College students have a wide choice when it comes to accommodation. Irish people are known for warm welcome and their friendliness, they make international student comfortable very soon, and student can choose any suitable accommodation in any location that can fulfill their requirement. Home stay – Often called living in ‘digs’, a home stay is the most common type of accommodation for younger students. Before deciding to study in Ireland, you should ensure that you have sufficient funds to cover your costs of living. International student can rely on their part-time income to meet all expenses which is generated by part time work during their studies in Ireland. International student requires a valid student visa to study in preferred college or university. Irish education system offers one major intake which is in September however, few university and college do provide minor intake in February as well. Apart from this, you have to check, university or colleges, courses, eligibility criteria, entry dates, application deadlines and language requirement. There are certain things you need to remember for visa application that is offer letter from institution, proof of funds, letter of recommendation, statement of purpose, PCC(a police certificate of good character), education bond, medical certificate, Health Insurance & Many More. In order to get student visa you need to fulfill some requirement i.e. Complete the application form & pay the fee, check all documentation, passport size photos, valid passport, offer letter of university or college. To streamline the admission process student must complete and submit their application 3-4 months prior. Before you set off from home to Ireland there are a few items that you need to ensure you have so that your journey is as seamless as possible. Your valid passport with Irish student visa. Your offer letter from the Irish institution, your letter of acceptance, and your accommodation details. Purchase health insurance to cover any major medical care necessary during the stay. Important documents (photocopies and originals). We advise you to have these documents in your hand luggage so that it can be checked quickly and easily. (Passport, Entry Visa, Evidence of Health Insurance, Acceptance of offer letter from institutions, Fees receipt). Your birth certificate, credit card, photographs. Important telephone numbers and addresses in India and Ireland. Climate will be different from your home country. So pack you baggage accordingly. International students must register with the INIS (formerly GNIB) after arrival. Student must open a bank account for ease in money transaction.